The hypothesis of fetal origins of adult disease has during the last decades received interest as an explanation of chronic, e.g. cardiovascular, disease in adulthood stemming from fetal environmental conditions. Early programming and enduring dysregulations of the hypothalamic-pituitary-adrenal (HPA axis), with cortisol as its end product, has been proposed as a possible mechanism by which birth weight influence later health status. However, the fetal origin of the adult cortisol regulation has been insufficiently studied. The present study aims to examine if body size at birth is related to circadian cortisol levels at 43 years. Participants were drawn from a prospective cohort study (n = 752, 74.5%). Salivary cortisol samples were collected at four times during one day at 43 years, and information on birth size was collected retrospectively from delivery records. Information on body mass during adolescence and adulthood and on health behavior, medication and medical conditions at 43 years was collected prospectively by questionnaire and examined as potential confounders. Participants born preterm or < 2500 g were excluded from the main analyses. Across the normal spectrum, size at birth (birth weight and ponderal index) was positively related to total (area under the curve, AUC) and bedtime cortisol levels in the total sample. Results were more consistent in men than in women. Descriptively, participants born preterm or < 2500 g also seemed to display elevated evening and total cortisol levels. No associations were found for birth length or for the cortisol awakening response (CAR). These results are contradictory to previously reported negative associations between birth weight and adult cortisol levels, and thus tentatively question the assumption that only low birth weight predicts future physiological dysregulations. During the last decades the hypothesis of fetal origins of adult disease has been proposed as a complement to social, behavioral or genetic etiological models . The hypothesis postulates that propensity to chronic diseases in adulthood can be partially explained by a hazardous pre-and peri-natal environment, such as fetal undernutrition or inappropriate demands ex utero due to preterm birth [1, 2]. Such harsh metabolic circumstances are thought to result in enduring adaptational changes in key physiological systems, a process called programming, conferring increased risks for diseases in adulthood . The hypothesis has been corroborated in a number of studies, where markers of inadequate fetal conditions (e.g., low birth weight) have been shown to predict a number of common diseases and risk factors, such as hypertension, obesity and insulin resistance [4–6]. Both preterm birth and small body size at birth have been shown to be important predictors for later development of disease . The hypothesis of fetal origins of adult disease presents theoretical challenges to models of cardiovascular and metabolic disease etiology and thereby might carry considerable implications for public health strategies directed at prevention of these diseases. Nevertheless, the mechanisms by which the intrauterine milieu influences the development of disease decades later remain to be elucidated. Programming of physiological stress systems, in particular the hypothalamus-pituitary-adrenal (HPA) axis, has been put forward as playing a central pathophysiological role [7, 8]. The HPA axis is a neuroendocrine circuit constituting a part of the physiological stress system, with its main end product cortisol exerting wide-ranging metabolic, cardiovascular, immunological and central nervous effects . Basal HPA axis activity and corresponding cortisol levels follow a circadian rhythm, with a sharp increase upon awakening (the cortisol awakening response, CAR)  and decreasing levels during the day, reaching low levels in the afternoon and evening. The HPA axis has the capacity for long-term dysregulations in face of early insults , with the development of metabolic and cardiovascular disease as a potential consequence in the long run [11, 12]. Considering that enduring HPA axis dysregulations are hypothesized to represent early features of the causal chain, clarifying the role the HPA axis in the fetal origins of adult disease at an age when the cardiovascular morbidity and mortality rates are still low could be particularly valuable. However, only a handful of studies during the last decade have examined the association between body size at birth (mainly birth weight) and circadian cortisol levels in adulthood, and a number of methodological issues preclude any definitive conclusions about the fetal origins of the adult cortisol regulation. In general, studies have indicated that body size at birth might be inversely related to the cortisol secretion in adulthood [13–17], while a number of studies have reported no association [18–21], or that the association might be dependent on gestational age . As pointed out in a meta-analysis by van Montfoort et al. , the majority of studies on the subject are based on small samples and might thus be underpowered; indeed, a pooled data analysis confirmed an inverse relationship between birth weight and (morning) cortisol levels . Several studies have comprised samples of either women  or men . Moreover, only a few small-sized studies have allowed for examination of time-of-day effects [15, 19], while the larger studies in adults have focused solely on morning cortisol levels [14, 16, 17, 22] or total cortisol secretion as assessed by urinary free cortisol . Since the regulation of the HPA axis is believed to differ with respect to the circadian rhythm , and dysregulations might be restricted to specific parts of the circadian rhythm [25, 26], this might possibly explain some of the inconsistent findings in previous research. In conclusion, the fetal influences on the cortisol secretion in adulthood have so far been insufficiently studied, which is regrettable since the issue might give clues to the pathophysiology of cardiovascular disease in adulthood. To address these shortcomings, the present study, a prospective cohort study with retrospective record-based data collection of body size at birth, was undertaken. The aim was to examine if body size at birth is related to the circadian cortisol secretion at 43 years. The sample was drawn from a 27-year prospective cohort study, the Luleå cohort, and comprises all pupils in ninth grade of the Swedish compulsory school living in Luleå in 1981, when the participants where 16 years of age (N = 1083; 506 girls and 577 boys), with follow-up surveys conducted in 1983, 1986, 1995 and 2008. The cohort has in various comparisons been found to be representative of the Swedish population . Of the original cohort, there were 1071 subjects still alive in 2008, of which 1003 (93.7%) agreed to participate. Due to non-response on one or more key measures (see below), the effective sample size of the present report is N = 752 (74.5%). The study was approved by the Regional Ethical Review Board at Umeå University and informed consent was provided by all participants. For more details about the study, see Hammarström & Janlert . The participants were investigated in 1981, 1983, 1986, 1995 and 2008 with a comprehensive questionnaire, focusing on the main areas of social, economic and work-related circumstances, health and health behavior and leisure activities. In 2008, delivery records of the participants' mothers from 1965 (i.e., pertaining the participants' own birth) were retrieved from the archives of the respective delivery ward. From the delivery records, information on birth weight, birth length, date of delivery, date for last menstruation prior to delivery, and diagnoses according to the Swedish adaptation of the 6th revision of the International Classification of Disease , was documented. In 2008, the participants completed one-day sampling of saliva. Salivary cortisol entails non-invasive sample collection and is highly correlated with the free and biologically active fraction of serum cortisol . Sampling instructions and plastic Salivette tubes were distributed to all participants by mail. Saliva samples were collected by the participants themselves during one week-day at four time points: at awakening (sample 1), 15 minutes post-awakening (sample 2), before lunch (sample 3) and at bedtime (sample 4). No eating, drinking, tobacco use or physical exercise was allowed the hour before sampling. Date and time for each sample were recorded by the participants. Samples were mailed to the laboratory at the Umeå University Hospital at the latest the day after they were collected. Upon arrival to the laboratory, samples were centrifuged and stored until analysis. A commercial radioimmunoassay kit (Spectria Cortisol RIA, Orion Diagnostica) was used to estimate cortisol concentrations (nmol/L), accordingly to the routines of the laboratory. Analyses were performed on single samples. Total precision was C.V. = 12% at 89 nmol/L and C.V. = 7.1% at 11 nmol/L, and the detection limit 0.7 nmol/L. In 1981 and 2008 the participants were weighed and their height was measured by trained medical personnel. In 1986 and 1995, self-reported height and weight were collected by the questionnaire. Birth weight (BW) (g), Birth length (BL) (cm), and ponderal index (PI) (weight/length3, kg/m3) were used as the main continuous measures of body size at birth. There were 990 valid cases for BW (92.4%) and 983 cases with available BL and ponderal index (91.8%). Gestational age was calculated as the time (weeks) between the last menstruation before delivery and the delivery, and all cases with a diagnosis of immaturity of the neonate were regarded as born preterm. Gestational age (GA) or diagnosis was only recorded for 657 cases in the delivery records. To preserve the sample size, a two-step procedure was therefore applied in the operationalization of preterm birth. First, all cases with a GA < 37 weeks and/or a diagnosis of immaturity was defined as preterm (n = 47/657; 7.2%). Second, a similar proportion of cases (7.2%) not classified as preterm in the first step, were classified as preterm based on birth weight, resulting in those with a birth weight < 2500 g being proxied as preterm birth. Of those with birth weight < 2500 g and with available information on gestational age and/or diagnosis, 89.7% were born before week 37 or had been diagnosed with immaturity. The correlation between the measured (preterm/diagnosis) and proxied (birth weight < 2500 g) variables were r = .70 (p < .001). Thus, all cases with a birth weight < 2500 g, as well as those of preterm birth or diagnosed immaturity were classified as preterm, n = 75 in the total sample and n = 60 in the effective sample (see Table 1). This variable is referred to in the manuscript as 'preterm or < 2500 g' or 'preterm or low birth weight'. There were 761 cases with at least one valid cortisol sample and 755 cases with complete cortisol data. Due to skewed distributions of the cortisol concentrations (nmol/L) they were transformed by the natural logarithm before analysis to achieve normal distribution. From these log transformed cortisol concentrations, three cortisol variables were constructed as our main dependent measures, to represent total HPA axis activity as well as activity at different parts of the circadian rhythm (see Gustafsson et al. for more details). 1) The area under the curve (AUC) was calculated with respect to ground  from sample 2-4, as an approximation of the total circadian cortisol output (log nmol/L × hours). The AUC was weighted by time by dividing with the total time between sample 2 and 4, yielding the unit log nmol/L. The AUC with respect to increase  was also calculated for complementary analyses. 2) The cortisol awakening response (CAR) was calculated as the log transformed concentrations at time 2-time 1 (dimensionless, equaling the log transformed ratio of sample 2 and sample 1), representing the cortisol response to awakening . 3) Bedtime cortisol levels correspond to log transformed concentrations of sample 4 and (log nmol/L) representing cortisol levels at a period of normally low HPA axis activity. Since there was a large variation in sampling times, and cortisol levels change rapidly in the early morning, participants with a time interval < 10 minutes or > 60 minutes between time 1 and 2 were excluded from the calculation of CAR. Self-reported health behavior at the 2008 survey was examined as potential confounder: smoking (yes/no), snuff use (yes/no), alcohol consumption (> 80th percentile). Alcohol consumption (gram pure alcohol consumption per year) was estimated from questions on the frequency of alcoholic beverage consumption, and approximate volume of beverage per occasion (separate items for beer, wine and spirits). Since body mass over the life course might be related to both birth weight  and to cortisol , body mass index (BMI) was also regarded as a potential confounder. BMI (kg/m2) was calculated for the participants at age 16, 43 (measured weight and height), 21 and 30 (self-reported height and weight). Since BMI at 30y and 43y were highly correlated (r = .79), BMI at 30y was excluded from the analyses to reduce multicollinearity effects. In addition, a number of medical conditions or medications that could possibly affect cortisol secretion were identified. Diabetes, depression and asthma was based on a question on the presence of different medical conditions during the last 12 months, with the response options 'No', 'Yes, modest' and 'Yes, severe'. A positive response was considered presence of diabetes (n = 13). Only 'severe' was considered presence of depression (n = 39) and asthma (n = 7). Participants were also asked about the use of oral glucocorticoids (n = 6), contraceptives (n = 84) and medications against depression (n = 45) and diabetes (n = 7). In total, 125 women and 35 men had either condition or used any medication. Menstrual cycle phase (n = 233) was calculated from self-reported days since last menstruation start at the time of saliva sampling; 0-14 days (follicular phase, n = 128) and 15-32 days (luteal phase, n = 105). Missing data was mainly due to drop-out on the cortisol measures. Those without cortisol data (n = 238) did not differ in body size at birth from those with available cortisol data (n = 752) (t test; p > .11). There were n = 752 cases (372 women, 380 men) available with at least one valid cortisol measure and birth weight information, comprising the effective sample. For descriptive statistics, see Table 1. 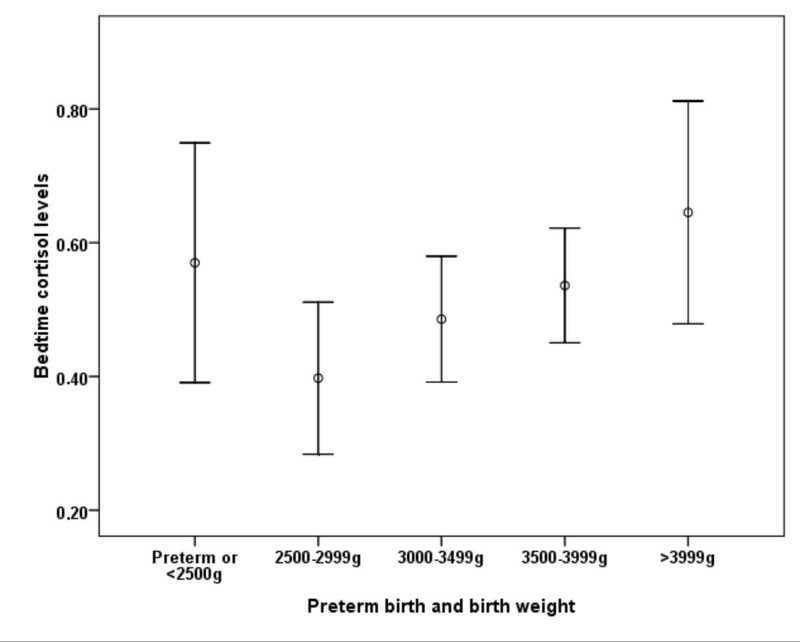 Since the relationship between birth size and cortisol levels in adulthood might be confounded by prematurity , preterm or low birth weight (< 2500 g) participants as defined by the proxy variable (n = 60) were excluded from the main analyses and examined separately in explorative analyses. These analyses were rerun on the subsample with known preterm status (i.e., recorded presence or absence of preterm birth or diagnosed immaturity), excluding those of preterm birth or with diagnosis of immaturity (n = 458). These analyses lead to similar results as the analyses on the inclusive sample, excluding those with proxied preterm status (data not shown). Analyses were also rerun excluding participants with self-reported presence of any medical condition (asthma, diabetes, depression) or using any medication (oral glucocorticoids, contraceptives, or medication against diabetes or depression), yielding similar results to analyses on the total sample (data not shown). To maintain the sample size, only the results from the inclusive sample are therefore reported in the results section. Complementary analyses included the potential confounders BMI during the life course and current health behavior. Due to missing data on one or more of the potential confounders, in the multivariable analyses the n dropped further, lowest in analyses simultaneously including body size, CAR and all confounders (n = 629). Information on menstrual cycle phase was only available for 233 women; exploratory analyses (t tests) revealed no significant differences in cortisol measures or birth weight (all ps > .20) between women in follicular and luteal phase (data not shown). Linear regression analysis was used in the main analyses to assess the influence of size at birth on cortisol measures at 43 years, separately for each cortisol measure, with the subsequent addition of potential confounders. The alternative AUC measure (with respect to increase) was significantly predicted by BW (p = .006) and PI (p = .030) similarly to AUC with respect to ground; only results concerning AUC with respect to ground are therefore reported in the results section. To aid the interpretation of the regression coefficients, kilogram was used instead of gram as the unit of measurement for birth weight in the regression models. Regression estimates are reported as anti-logged unstandardized coefficients (b) and standardized coefficients (β). For the purpose of graphical presentation, cases were categorized into groups based on birth weight intervals of 500 g; < 2500 g or preterm birth (n = 60), 2500-2999 g (n = 118), 3000-3499 g (n = 248), 3500-3999 g (n = 229), and ≥4000 (n = 97). Analyzes were conducted on the whole sample as well as on women and men separately. SPSS v17.0 was used for all analyses. Men had larger body size at birth than women and higher total (AUC) and bedtime cortisol levels at age 43 (Table 1). The body size measures were, as expected, correlated; BW correlated strongly with BL (r = .79) and PI (r = .55), while BL was not related to PI (r = -.06). Correspondingly, AUC correlated strongly with bedtime cortisol (r = .70) and weakly with CAR (r = .11), while there was no association between bedtime cortisol and CAR (r = -.03). Regressing AUC on body size at birth measures indicated a positive relationship between body size measures and total cortisol secretion (see Table 2). In the total sample, AUC was significantly predicted by BW (R2 = 1.7%) and PI (R2 = 0.9%), but not by BL. One kilogram increase in birth weight corresponded to a 13% increase in AUC. Similar patterns for birth weight was observed in men, while in women this association was of weaker magnitude and not significant. Similar analyses were performed with CAR and bedtime cortisol as criterion variables, to examine specific influences on distinct parts of the circadian cortisol rhythm. While there were no significant relationships between body size at birth and CAR (data not shown, all ps > .10), positive relationships were found for bedtime cortisol levels (see Table 3), similarly to the models including AUC. In the total sample, both BW (R2 = 1.3%) and PI (R2= 1.5%) appeared to exert influences on bedtime cortisol levels; one kilogram increase in birth weight involved 19% increase in bedtime cortisol levels. As with the AUC models, similar results for birth weight was observed in men, but were weaker and not significant in women. Adding BMI at age 16, 21 and 43 and health behavior at age 43 did not influence the findings substantially (data not shown); in the total sample the regression coefficients were still significant for both BW (p < .001) and PI (p = .019) in the AUC models, and for both BW (p < .001) and PI (p < .001) in the bedtime cortisol models. Similarly, regression coefficients were still significant after excluding cases with medical conditions, medication or contraceptives (data not shown); for BW (p < .001) and PI (p = .025) in the AUC models, and for BW (p < .001) and PI (p < .001) in the bedtime cortisol models. A descriptive exploration of the excluded preterm or low birth weight (< 2500 g) participants (n = 60) indicated that this group displayed high AUC and bedtime cortisol levels at similar levels as the groups with large body size at birth. As can be seen in Figure 1 (AUC) and Figure 2 (Bedtime cortisol levels), this resulted in a curvilinear relationship between BW and cortisol measures when including the entire sample. 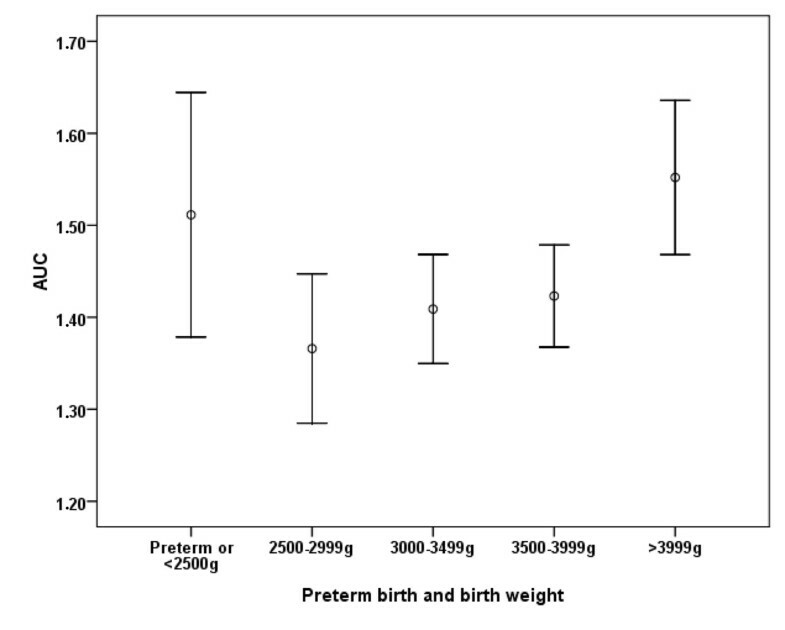 Area under the curve (AUC, log nmol/L, mean and 95% CI) by intervals of birth weight, and preterm or < 2500 g birth. Bedtime cortisol levels (log nmol/L, mean and 95% CI) by intervals of birth weight, and preterm or < 2500 g birth. The main finding of this study is that birth weight and ponderal index are related to total cortisol levels at 43 years, which seemed to be explained by increased levels during the latter part of the day, independently of current health behavior and body mass over the life course and unaffected by the exclusion of participants with medical conditions and medications. Interestingly though, while most studies have found birth weight to be negatively related to cortisol levels in adulthood [15–17, 23], we found the opposite direction of association: higher cortisol levels by larger body size at birth, across the normal spectrum of birth weight. This unexpected finding calls for some elaboration as to why our results would differ so substantially from previous findings. First, most studies on the subject have been performed on small samples and a considerably higher drop-out rate which could introduce selection bias and misestimation of associations, compared to our population-based sample with high participation rate. Second, most studies on adults, and all with larger sample size (e.g., ), have not specifically examined cortisol levels during the latter part of the day, which in our analyses was the period of the circadian rhythm most prominently related to birth weight. Rosmalen and co-workers  have reported no substantial influence of birth weight on either morning or evening cortisol levels, but their large sample consisted of 10-12-year-old children, so their findings might not be directly generalizable to adults. Third, important sample characteristics (e.g. age range at the time of cortisol measurement) differ considerably between studies, rendering direct comparisons of dubious validity. However, yet another issue might be helpful for understanding the discrepancies in results: the management of preterm or low birth weight cases. In an explorative examination, preterm birth or low birth weight (< 2500 g) seemed to be related to higher bedtime cortisol levels of similar magnitude as of the group with the highest birth weight. This suggests that increased basal HPA axis activity might be produced by either harsh pre- or perinatal metabolic circumstances, or in the normal spectrum, also by supposedly favorable circumstances. Discrepant associations for preterm children compared to mature birth children in relation adult cortisol levels have been reported previously by Kajantie et al. , who found a positive relationship in children born at a later gestational age (> 39 weeks), but a negative association in those born early at term (37-39 weeks). A U-shaped association between birth weight and 24-hour glucocorticoid metabolites has also been described in preadolescent children . Although these studies differs from the present one on major methodological points, it corroborates the possibility of a positive relationship between birth size and adult cortisol levels in those maturely born, and a U-shaped association across the entire range of maturity and gestational age at birth. This finding may warrant a re-evaluation of the hypothesis that only low birth weight might confer health-related physiological dysregulation in adulthood. Elevated evening cortisol levels have been found in men with coronary artery disease, correlated with markers of inflammation  and has also been linked to morbidity of chronic diseases as well as to mortality rates in women, but not in men , indicating that normal but high evening cortisol levels might confer increased health risks and thus emphasizing the potential public health importance of our findings. Although the associations reported in this study were rather weak, the long-term association with measure points 43 years apart would suggest that the observed dysregulations are enduring and stable, which could exert a health-damaging effect possibly over the entire life course. Moreover, even small effects might be of public health importance when generalized to the general population. Although there is evidence of health-damaging consequences of high evening cortisol levels, the possibility of high cortisol levels representing a healthy pattern and low cortisol levels representing potentially harmful hypocortisolism  has to be considered. Hence, our findings cannot be unambiguously interpreted as representing an increased health risks with increasing birth weight, although we also found numerically high cortisol concentrations in the preterm or low birth < 2500 g subgroup- a group with well-established health risks across the life course [2, 40]. Since the fetal origins hypothesis examining outcomes such as cardiovascular disease has found linear relationships between birth weight and health measures, the pattern of a U-shaped relationship to cortisol seem to be contradictory. Speculatively, it is possible that different mechanisms operate in the normal spectrum of maturity as compared to those of preterm birth or of low birth weight, with different physiological trajectories yielding apparently similar outcomes in adulthood. Nevertheless, the significance of increased cortisol levels for these groups remains to be elucidated. The analyses on women and men separately entailed lower power compared to the analyses on the total sample, as indicated by the less reliable findings, and should therefore be interpreted with caution. However, the separate analyses suggest that the influence of birth weight on both total (AUC) and bedtime cortisol levels was largely driven by corresponding associations among men, while these associations were considerably weaker and non-significant among women. As pointed out in a recent review , low birth weight is more consistently related to an increased HPA axis reactivity to acute stressors in men than in women, while there seems to be a greater influence on autonomic nervous system response in women. Thus, our results indicate that the circadian HPA axis regulation, in addition to the HPA response to acute challenges, might be more sensitive for early life influences in men than in women. We did not find any evidence for an effect on the cortisol levels during the earlier part of the circadian rhythm. As described in the introduction, research focusing on parts of the circadian rhythm has almost exclusively studied cortisol levels during the early morning, and perhaps this is a partial reason why the literature on fetal origins of adult cortisol levels is abundant with null findings. There could also be methodological explanations to our null findings concerning CAR (see below). Major strengths of the study include a large representative sample with low drop-out rate, and the saliva sampling protocol including assessment at different part of the day. Although there was a considerably larger drop-out on the cortisol measures, there was no evidence for selection bias with respect to birth weight. Saliva was sampled only during one day. This would be expected to contribute to measurement error and attenuation of observed relationships. Sampling over several days would have been a preferred method. Since cortisol levels peak approximately 30 min post-awakening, our lack of findings regarding the cortisol awakening response could possibly be attenuated by the sampling protocol of only 15 min between morning samples. Moreover, since we have no information regarding the accuracy of reported sampling time, non-adherence could introduce random error and attenuation of estimated effects . Although the cortisol levels would not be expected to be influenced greatly by minor variations in sampling time during the later part of the day, the estimation of CAR is sensitive to such non-adherence since cortisol levels change very rapidly during this part of the circadian rhythm. For example, even a short time interval between awakening and the first sample could greatly influence the estimation of CAR [43, 44]. Although time of awakening was not reported by the participants, self-reported sampling time might not be an optimal method . These issues could possibly be methodological explanations of our negative findings regarding cortisol levels in the morning. While objective measures of the time of awakening and sampling would have been an optimal method to reliably assess the CAR, such high-constraint methods might be difficult and costly to implement in large population-based samples. In those not born preterm or with low birth weight, birth size and ponderal index are positively related to circadian cortisol levels during the later part of the day in mid-adulthood. Similarly high cortisol levels also seem to be present in those of preterm birth or of low birth weight. Together, these findings indicate that elevated cortisol levels might be a consequence of both ends of the maturity birth spectrum; an issue that has to be further examined in future research. Moreover, the pathophysiological significance of such relative hypercortisolism has to be elucidated, with the aim of understanding the mechanisms by which fetal circumstances influence health later in life. Data collection at age 43 was funded by The Swedish Research Council and by The Swedish Council for Working Life and Social Research. The funding bodies had no role in study design; in collection, analysis or interpretation of the data; or in writing or submission of the manuscript. We also wish to express our gratitude to all the participants in the study. AH was responsible for the conception and design of the study and UJ and TT contributed to the design of the study. AH and UJ were responsible for the data collection. PEG was responsible for the statistical analyses and writing the first draft of the manuscript. All authors participated in interpreting the results, provided input on manuscript drafts, and read and approved the final manuscript.